Breckenridge Resort‘s namesake went from being Vice President of the United States to fleeing on a boat to Cuba. Find out why the town changed the spelling of his name. And find out how to get to the oldest bar west of the Mississippi. John Cabell Breckinridge is the youngest man to serve as Vice President of the United States. The lawyer from Kentucky was elected at age 35, the minimum age required by the Constitution, to serve beside President James Buchanan in 1856. Breckinridge ran for President four years later and lost to Abraham Lincoln. He returned to Kentucky and became a State Senator until being expelledin 1861 (less than a year after being elected) for remaining loyal to the Confederacy while Kentucky voted to stay in the Union. Fleeing possible arrest, he escaped to the South and became a general for the Confederate Army during the Civil War. He was later made the Confederate States Secretary of War. After the war, Breckinridge used a tiny boat to escape to Cuba in fear of being put on trial for treason. He persisted to the United Kingdom and Canada before being granted amnesty and returning to the United States years later. He died of cirrhosis in 1875 at the age of 54. In 1859, a town for gold miners was set up along the Blue River in Colorado. The town was called “Breckinridge” in hopes of flattering Vice President John Breckinridge in order to get a post office. The plan worked and Breckinridge became the first town between the Continental Divide and Salt Lake City to get a post office for its 8, 000 residents. When John Breckinridge joined the Confederate Army two years later, the outraged citizens voted to change the spelling of their town name. They swapped the first “i” with an “e” to make their home forever known as Breckenridge. The Gold Pan Saloon was originally opened (under a different name) to accommodate the many gold miners chasing their dreams on the Blue River. Built first in 1861 as a tent that served many thirsty prospectors, then established as a permanent structure in 1879, the Gold Pan Saloon is still open today at 103 N. Main Street in Breckenridge and is documented as the oldest continuously operated bar west of the Mississippi. In 1961, about a century after the town was established, Breckenridge Ski Area opened with one double chairlift and a small T-bar. About 17, 000 visits were recorded that season even though I-70, the main thoroughfare to Breckenridge, wasn’t complete yet. 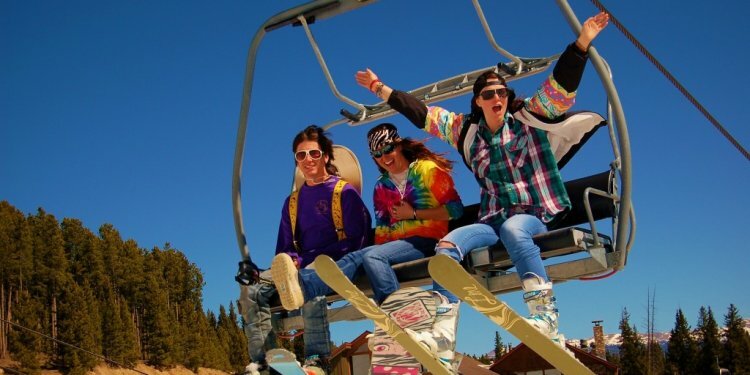 Twenty years later, Breckenridge installed the world’s first high-speed quad chairlift, capable of transporting 2, 800 skiers per hour! Today, Breckenridge Ski Resort is one of the top-ranked ski resorts in the world. It gets over 1.5 million skier visits per year and hosts many major ski and snowboard competitions.